This Italianate commercial building was built for Miss Pauline Lange, a popular Victorian socialite. It features triple bays with double-hung windows and cast iron columns that define the lines of the bays. Bay windows, extending over the street, were popular in the 1890s as they allowed occupants of the rooms better access to light and fresh air. A strong cornice with brackets marks the skyline. Miss Lange (she is shown in several City Directories as “Mrs” Lange, but she never married) operated the upstairs as a small lodging and rented the downstairs storefronts to businesses. 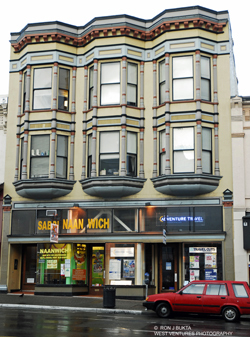 In 1907, the spaces were occupied by Oscar Lucas – City Fair, a dry goods business and R. Kawai who sold Bamboo furniture. The lower space was later used as a liquor store by the Hudson Bay Co. In 1934, the building was purchased by Walter W. Cross for $10,000. He operated a butcher shop there. He had started in Victoria West in 1920 on Craigflower Road and would eventually own a chain of six stores. After World War II, Walter handed over the business to his son Bob Sr. and his son-in-law George Saul. In 1974, Bob Sr. transferred his ownership in the business to his son, Bob Jr. and his son-in-law Arthur Baird. With the growth of supermarkets, Cross’ Stores consolidated itself into one retail/wholesale outlet on Douglas Street and added a gourmet deli bar. Bob Cross Jr. served as City of Victoria Alderman 1991-1993 and Mayor 1994-1999. In 2000, facing declining red meat sales and a demand for downtown housing, he decided to close the business and to restore the building. Following a seismic upgrade and careful restoration of heritage features, the upper two storey’s that had say vacant for years, were converted to eight character suites. The main floor was transformed into two commercial storefronts.